Former topnotch attorney Parker Stern, still crippled by courtroom stage fright, takes on a dicey case for an elusive video game designer known to the world only by the name of "Poniard." In Poniard's blockbuster online video game, Abduction!, a real-life movie mogul is charged with kidnapping and murdering a beautiful actress who disappeared in the 1980s. Predictably, the mogul--William "the Conqueror" Bishop--has responded with a libel lawsuit. Now it's up to Parker to defend the game designer in the suit. In defending Poniard, Parker discovers that people aren't who they claim to be and that nothing is as it seems. At one point, his client resorts to blackmail, threatening to expose a dark secret about Parker. Then, many of the potential witnesses who could have helped the case die prematurely, and the survivors are too frightened to talk. Parker begins to feel as if he's merely a character in a video game, fighting malevolent Level Bosses who appear out of nowhere and threaten to destroy him. 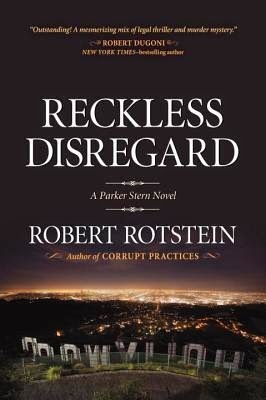 Rotstein is back with a second book/installment in what seems to be the beginning of a series featuring Parker Stern. Stern is a lawyer who just recently started suffering from debilitating stage fright whenever he’s in a courtroom. This time around, Stern is working in a mediators office which affords him the opportunity to practice law without stepping foot in a courthouse. Unfortunately, trouble seems to find him wherever he goes. Poniard, an anonymous game designer, debuts a video game where one of the most powerful men in Hollywood kills off an actress who in real life disappeared years ago. Poniard contacts Stern online and asks him to represent him after he is subsequently sued by the media mogul. Stern agrees to take on the case even though he never meets Poniard in person because it gives him a chance to go up against his former lover, Lovely Diamond. Describing the story can get complicated but Rotstein does a great job of creating a seamless story that grips you as you try to figure out all the angles right along with Stern. The city of L.A. once again makes a guest appearance. You don’t have to read his first book, Corrupt Practices, but it was nice knowing the whole picture whenever Stern referred to his past. I am definitely looking forward to the next Parker Stern installment.